The Burlington New Millennium Orchestra (BNMO) is a professional orchestra comprised of highly respected musicians and talented soloists whose performances are comparable to the Canadian Opera Company, Metropolitan Opera and Boston Pops, as well as being inspired by the Trans-Siberian Orchestra. Specializing in broad-based non-classical performances, BNMO is genre crossing. 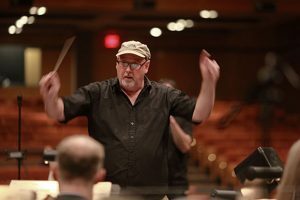 Our repertoire features Pops, Broadway, Jazz, Rock, and World Music, and many of the scintillating arrangements are penned personally by Conductor and Artistic Director Charles Cozens. To present unique concerts featuring high caliber performing artists from the local, national and international arts communities. BNMO presents a fusion of cutting-edge digital music technology integrated with traditional instrumentation that redefines the concert-going experience. The Burlington New Millennium Orchestra is incorporated as Not for Profit and is a Registered Canadian Charity. Governance is established through a carefully selected and experienced Board of Directors. Charles Cozens conducting the Burlington New Millennium Orchestra. Conductor and arranger Charles Cozens rehearsing for The Nylons farewell tour. Randy Bachman and Charles Cozens of the Burlington New Millennium Orchestra. The Burlington New Millennium Orchestra was the creation of acclaimed arranger, conductor and producer, Maestro Charles Cozens. The orchestra evolved over 25 years ago from a commission that Charles received to create and record, fresh and innovative orchestral arrangements of Canadian hit pop songs. The concept proved to be successful in the studio but it has taken till now to replicate the sound live on stage and create new and compelling orchestral landscapes. 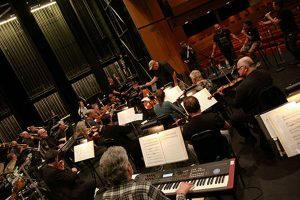 Established in 2016, Burlington New Millennium Orchestra is now at the forefront of digital music technology and has helped to redefine the traditional concept of an orchestra. Our objective is to present unique high caliber concerts to the people of Burlington, Greater Hamilton area and the GTA featuring gifted performing artists from the local, national and international arts communities. BNMO will also foster collaborations with other local arts groups, engage younger audiences through selective outreach programming and aspire over the next five years to tour across North America. 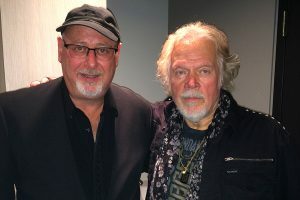 “The loud ‘n’ proud show, aptly titled Randy Bachman Symphonic Overdrive featured two full sets of the Winnipeg-born artist’s hits arranged by acclaimed Canadian conductor/arranger Charles Cozens, who also joined Bachman onstage on keyboard.